We report the first precise U–Pb isotope data on cassiterite from the large Xianghualing tin-polymetallic deposit in the central Nanling district, South China. The results show that four separates from sample XF-51 have a relatively narrow range of 206Pb/238U apparent ages, varying from 152 to 157 Ma, and the three 206Pb/238U apparent ages yield a weighted average value of 156 ± 4 Ma (MSWD = 0.32). Separates from two other cassiterite samples do not have sufficient radiogenic Pb to generate a reliable 206Pb/238U age. Seven separates from the above three cassiterite samples define a well-constrained 238U–206Pb isochron corresponding to an age of 157 ± 6 Ma (MSWD = 34). A comparison of the U–Pb cassiterite ages with published Ar–Ar dates on muscovite from this deposit and K–Ar age data on biotite from the pluton genetically related to the tin mineralization in this area demonstrates that the U–Pb isotope system of cassiterite is a potential geochronometer. 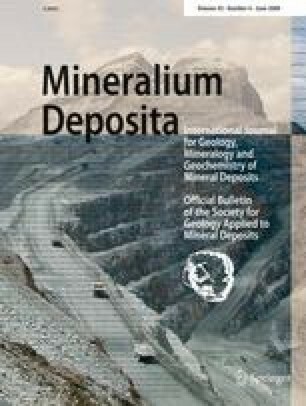 Combined with the Ar–Ar dates of muscovite from this deposit, we can constrain the absolute age of tin-polymetallic mineralization in Xianghualing at 154–157 Ma. The dates obtained in this study, consistent with the published geochronological results from other important deposits in this region, reveal that the large-scale tungsten–tin mineralization in the central Nanling region was predominantly emplaced during 150–161 Ma. This research was financially supported by the Important Program of Knowledge Innovation from the Chinese Academy of Sciences (Grant KZCX3-SW-125) and the Natural Science Foundation of China (Grant 40673021 and 40472053). We thank the geologists of the Xianhualing Mine for their help during our field investigations. Special thanks are due to Prof. Bernd Lehmann and Prof. Mao Jingwen for their invaluable suggestions that helped to improve an early draft of this paper. We thank Rolf Romer for his helpful comments on the manuscript.